Built in 1856, this building has already had a long life hosting various businesses like a post office, hotel and grocery store. 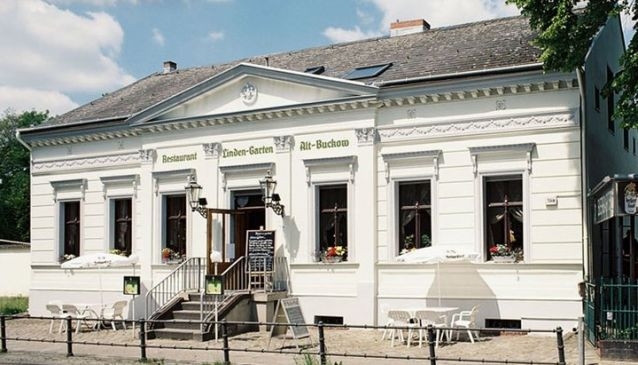 Now, it's the Restaurant Linden-Garten and a small guesthouse whos charm and history are inviting you to join the ranks of the thousands that have passed through its 150 year old doors. Serving up a traditional home made German cuisine along side fresh and healthy seasonal dishes you are welcome to sit in the restaurant, up at the bar or even under the lime trees in the gorgeous beer garden when the whether permits. The wine list is impressive and they even have a supply of freshly and privately brewed beer from a small local brewery in Neukölln. There is a function room available for parties and groups as well as comfortable guest rooms in the attic for the overnight stay.